Loss of foot traffic has led to relocation and an Indiegogo campaign. 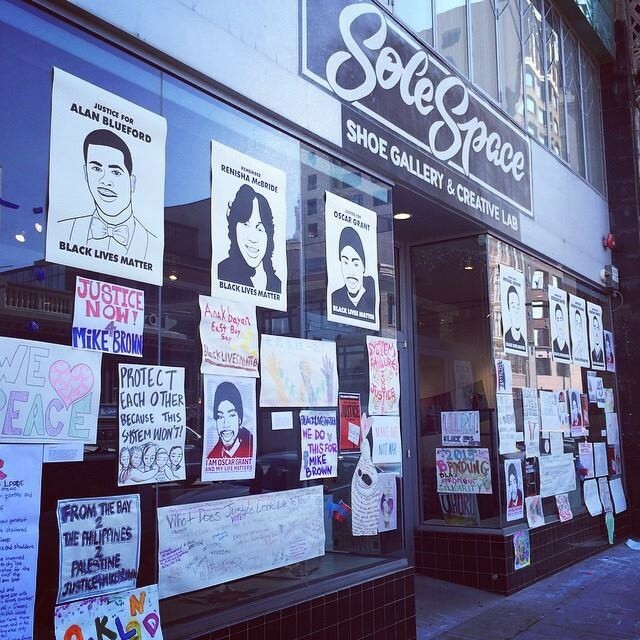 While other stores boarded up during recent #BlackLivesMatter protests, SoleSpace opened its doors and offered free sign-making materials. Last Friday, a group of vivacious dancers, busting moves from flamenco to twerk, held down the floor at SoleSpace amidst rows of sneakers and local artwork. The sweaty celebration marked the launch of a new fundraising campaign for the shoe store, art gallery, and community hub that has been bringing people together in downtown Oakland for the past three years. At first glance, SoleSpace looks like a regular shoe store. But — while the shoe selection is top-notch — the shoe sales are actually a strategy to fund a community space. SoleSpace features exhibitions by local artists every month, frequently hosts social-justice-oriented community gatherings, and donates its space to local organizations for events on a sliding scale. In the time that it has been open, it has become a valuable space for artists and activists to come together near the city center. But due to a prolonged street closure, foot traffic into the store has dropped dramatically, and sales have been low, said owner Jeff Perlstein in a recent interview. As an effort to increase revenue, the SoleSpace retail store recently expanded to a new location on Grand Avenue (3304 Grand), where the team anticipates a boost in sales. But, the new space is too small to host community events, so the team hopes to keep their Telegraph location open in order to continue their core programming. That's where the Indiegogo campaign comes in. SoleSpace needs to raise $13,000 if it's Telegraph location is going to make it through the summer.